Dynamometer tests by a major diesel engine manufacturer have proven that SUDDEN LOSS OF COOLANT CAN DESTROY YOUR ENGINE IN 50 SECONDS and it will do so before an overtemperature signal is received. Overtemperature sensors are only capable of sensing excessive coolant temperature caused by clogged radiators, malfunctioning thermostats, failed water pumps, or any other “circulation” problem. 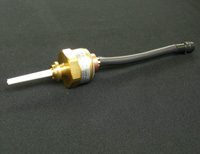 Upon loss of coolant, however, these temperature sensors must try to respond to hot air which, being a poor thermal conductor, results in signals that arrive only after the engine is severely damaged. By monitoring the coolant level in the upper radiator reservoir, the Robertshaw Mini-Tek Model 613 provides a WARNING IN TIME that coolant is being lost and allows corrective action to be taken before overheating and damage can occur. In like manner, under leaking oil conditions low oil pressure signals are not obtained until the oil pump is starved for oil. Since the oil pump draws liquid from the very bottom of the crankcase pan, these signals arrive only after virtually all oil has been lost. Again! – the damage has already occurred.